I didn't watch the trailer but I heard there's a line about Woodcock threading secrets into the dresses he makes? I imagine someone else has already made this connection, but that recalls Freddie Quell mysteriously referring to the "secrets" that go into his alcoholic concoctions. OK, when talking about specifically just the "physical" look (the film stock, lighting choices), I would consider The Master and IV to be generally different. But then once we start talking about framing choices, mood, depth of costume design, etc., I think they do become similar in lots of respects (although IV did employ some handheld shots and things like that, unlike The Master). I DO definitely think there is overlap in some of the immediate shots. 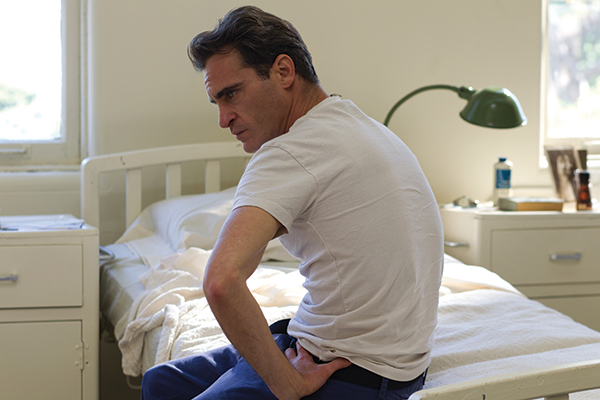 For example, in The Master, when Freddie is undergoing some testing (he's shown pictures and asked to say the first thing that comes to mind), he's sitting in a drab, sparsely furnished room. Doc's office in IV is a sparsely furnished, drab-colored old doctor's exam room. They look really similar across the films. (I consider this to be a pretty PTA touch because, in the book, Doc's office is upstairs, has a sign on the door with a giant eyeball on it that has green and magenta veins around the iris and "LSD" written above it, an old modular booth from a restaurant or diner with a formica-topped table in the middle, and papers and stuff spread all over the table, including old match boxes, tickets, a typewriter, joint roaches, an ashtray, etc. So the office in the book is a much more cluttered, hippy-styled affair.) One thing I'm struck by with both is the kind of simultaneously realistic but cinematic look. Many of the compositions are framed simply and the cuts very long, so there's a sort of realistic, tactile feel to things -- yet they still feel a bit more hyper real or dream-like than, say, a French new wave film. Most of me wants to chalk this up to the direction and the choices of film stock, cameras/camera settings, and lighting. And also the acting/directing combo. Of course, this is all splitting hairs between The Master and IV. There are similarities and differences between the two within many frames. I think both have the recent PTA drama vibe, though, if you know what I mean. P.S. I really recommend reading IV to anyone interested in a thought-provoking psychedelic romp. Pynchon is my favorite author and one of the few artists who I can wholeheartedly say changed my life. The Master and IV look the same even if Elswit came back in between. Do people agree with me? I'm saying it as a gut feeling. I have a similar sense, although I wouldn't say they're exactly the same or anything. I have yet to substantiate this hunch through a close comparison of both films, though (after editing in some screen caps, I'm not even sure how convinced I am anymore, because TM definitely has this darker, moodier, melancholic look, and IV seems way softer and brighter...so whatever "overlap" I detected definitely doesn't go that far). 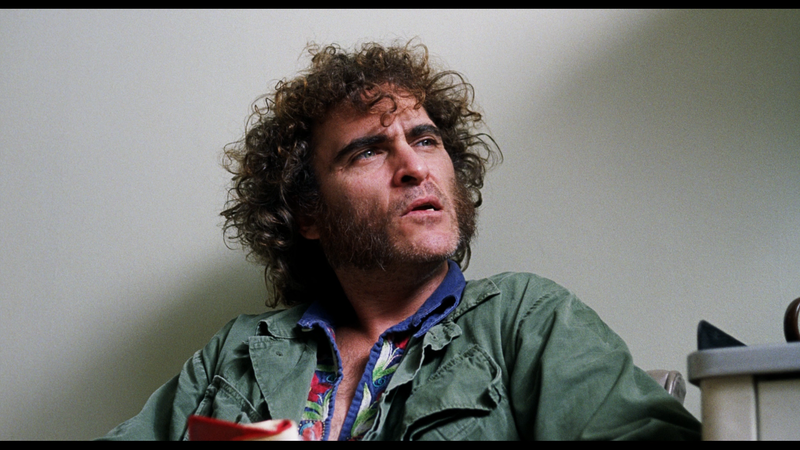 If you look at the scenes inside Doc's office in Inherent Vice, and compare them to the scenes of Freddie in the hospital near the beginning of the The Master, I believe there's some similarities there in the texture of the image, the plain backgrounds, and the distribution of light. I know "texture of the image" is too vague, but again, this is mostly just a hunch (it's been a while since my last viewing of either film). IIRC, the effect I'm talking about can probably be described as "naturalistic," as opposed to overtly expressionistic and stylized. 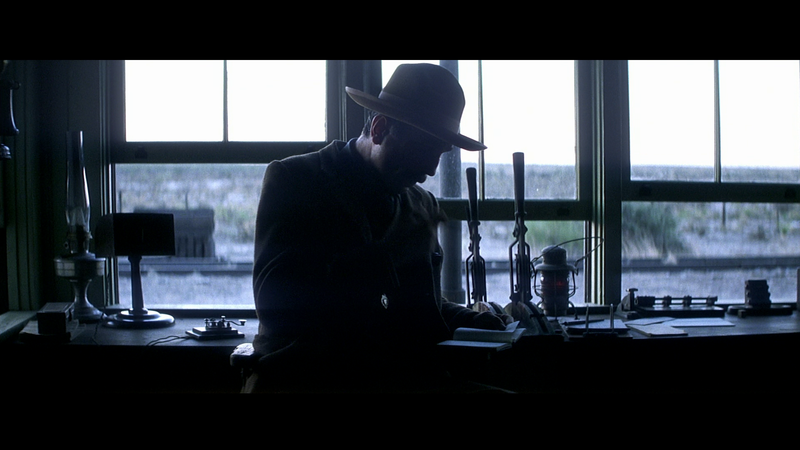 There's this kind of blanched quality via lots of white light -- literally streaming in through windows in a Janusz Kaminski/bloom-esque effect (like here in TM and here in IV) or through the background color. During his "master class" thing at NYFF, Anderson said something about admiring Robby Müller's cinematography in Repo Man. He said Müller made the night shots actually look like nighttime. I think you can detect something similar going on in some scenes from TWBB, TM, and IV -- an "authentic," no frills kind of thing. 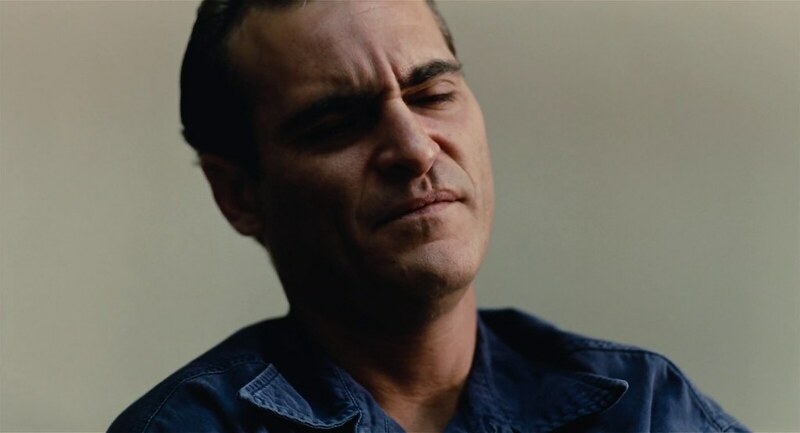 There are still moodily arranged, expressionistic moments in all of these films, of course, and they're great, but there are other bits where it feels more like a decidedly unfussy, detail-oriented, naturalistic showcase for an actor's face, without shadows or snazzy lights stylizing or obscuring someone's appearance. Even when the shot is dimmer and there are more shadows, it can still feel like natural magic hour stuff rather than, say, a Wes Anderson close-up, where, IIRC, color and light can sometimes go full-tilt in a contrived and artificial way (still nice, though). I think this is evident in TWBB when Plainview is brooding in his office before stepping out to address the Little Boston denizens. 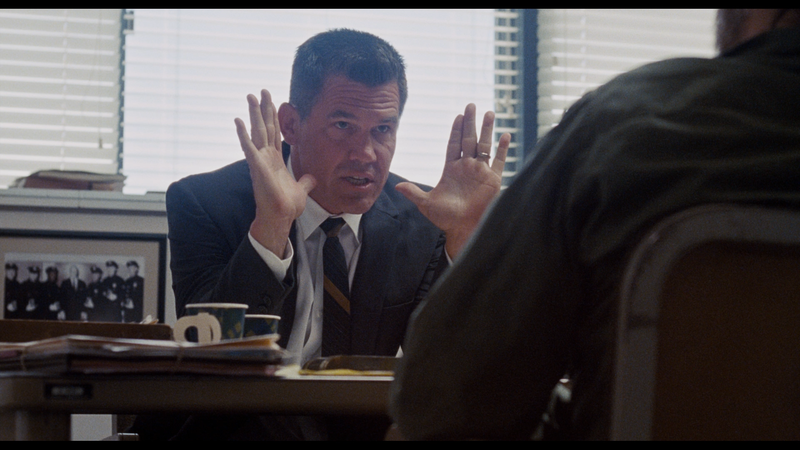 It's a shadowy shot but it's in the same naturalistic ballpark (actually, a better example is probably this one moment near the end of the film...I believe there's a great close-up on Plainview in his office there?). 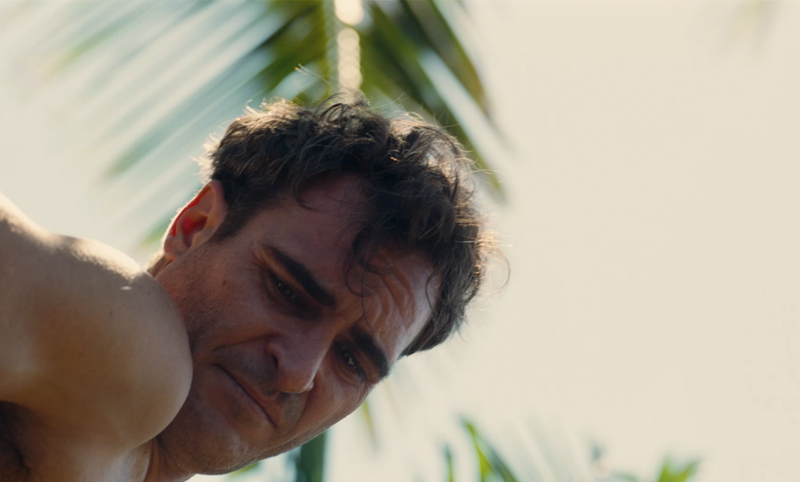 It just scans as authentic and down to earth...a Malick-esque seizing of the right light at the right time of day, rather than, say, Barry and Lena in the blue haze of that car ride in PDL (which is also beautiful, but in a different way). EDIT: Added some screen-caps...although I'm not sure if you'll think they effectively support this hunch or if I'm making any sense. TM definitely seems to feature more contrasts between dark and light, but there's still some overlap in terms of that soft, natural look I'm struggling to define. I've been wondering why DDL is not listed as a co-writer of the film? It's the Mike Leigh approach. Spends month improvising and developing the story with your actor friends and then keep the writing credit for yourself. Nah, but I reckon DDL was probably like PSH on The Master- DDL helped develop Reynolds Woodcock and his overall arc (and the dialogue it seems) but PTA still sat down and wrote out the scenes and all. Screenwriter guild rules may play into it to but PTA obviously takes this writing thing seriously and probably did the bulk of the work. has anyone else seen a Phantom Thread poster hanging in their local theaters yet? I'm in Pittsburgh and just saw one last night. seems we're a part of the limited release as the poster still said Dec 25th. Those are both in Los Angeles, or...? Cool! I haven't seen one yet. I'll be lucky if it screens near me. 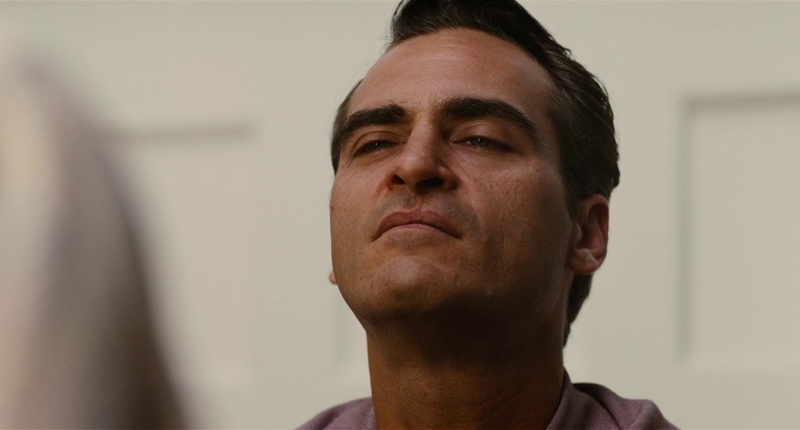 The Master did screen in my city, but then the closest to me that Inherent Vice screened was in the much larger city about an hour away. With parking and gas, it would've been possibly a $100 night. Pretty frustrating. I found it strange that Hateful Eight didn't screen anywhere near me when it came out. Considering that Inglorious Basterds made quite a bit of money by Hollywood standards and then Django Unchained made even more, it boggles my mind that Hateful Eight just wasn't picked up. Maybe my local chain cinema got fed up with all the N words in Django and Tarantino's reputation for violence in general (though I really don't think his films are that violent at all .... The new Saw film is probably way more violent and graphic). Just kind of lame that all these crappy superhero movies were playing at the time instead. But only for Academy and SAG members. A woman saw Phantom Thread. Upon my return from Paris I went to see Paul Thomas Anderson’s Phantom Thread with Daniel Day-Lewis. It is supposed to be his last film as an actor. He plays a dressmaker in the 50s, loosely based on Charles James. As always, it was a remarkable performance and I would not be surprised if he wins all the awards. And she has nothing to say about it, too. First "Phantom Thread" screenings will be Nov. 24. SAG & Academy? Wonder when DGA will screen it. You've escaped the ten minutes "more of a comment than a question".